This is a Smith-Victor Thrifty Cordset with 5/8" Mount. Use with screw-base photoflood lamps or AC slave units. Box Dimensions (LxWxH) 6.35 x 2.45 x 1.7"
Thrifty Cordset with 5/8" Mount is rated 4.8 out of 5 by 8. Rated 5 out of 5 by GRE Photo from Great light holder I am using this lamp holder for mobile video with an LED flood bulb and a Photogentic ION battery pack mounted on a Stroboframe Pro-RL Flash Bracket with a RPS Studio 12 Speedlite Beauty Dish. This great lamp holder was the finishing touch that completed an awesome rig. It weights almost nothing so its addition to the total weight has made no change in being able to hand hold my set up. Only problem I had was that the bracket itself did not hold the socket tight enough, but a little rebending on the vise with a hammer fixed that and now the system and socket work great. Rated 5 out of 5 by Kenneth from perfect fit - right price I have three old lights that I use mainly for video work, but they were not compatible with my light stands so I had to use masking tape to attach them. I purchased these mounts because at the price I wasn't going to lose much if they didn't work out. They not only worked out, they fit perfectly into my reflectors and attached to my light stands with no problems. Rated 5 out of 5 by Jian from Not just for Smith-Victor Flood-Sets... 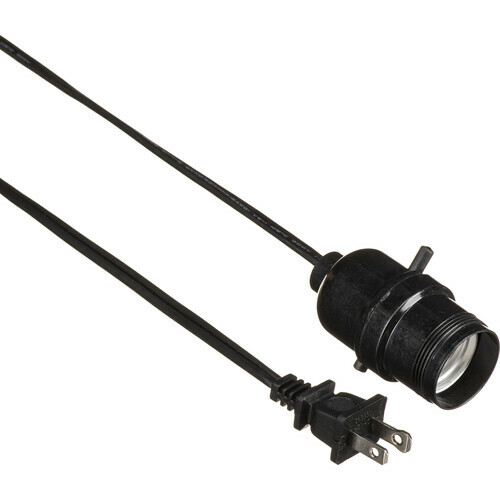 Durable to 500w, this is THE replacement cord/toggle/socket set for flood lights. I've had my kit for over six years, and the only reason I had to replace it was the result of an accident that rendered it damaged, acceptable under those conditions. This can and will last you a long time, and through many a mishap, and the price is very much worth it. Rated 4 out of 5 by CCQDesigns from Great to have parts available! Knocked over my light on concrete and broke just the switch. So glad that I was able to buy just the part I needed instead of the whole thing. Fit into the base and reflector perfectly with no problems. Rated 5 out of 5 by Anonymous from Great Item for a great price! ... was a perfect replacement item! Very happy with B&H and will be a return shopper!!! Rated 5 out of 5 by Anonymous from Cordset for Smith Victor Lamp This is just what I was looking for. The best thing I can say is that I ran all around town looking for this after my lamp fell and broke. No one had this part. Ordered it online and it was there three days later. Awesome. Rated 4 out of 5 by heavypaws from They do the job, but a bit awkward These are used for lighting my studio. I really like the simplicity, but the apparatus for attaching them to stands is a bit awkward. I am pleased with them and would recommend them to anyone. Rated 5 out of 5 by Anonymous from A fine replacement! I was happy to see B&H carrying the replacement cord set. My light broke so I was pleased to know I didn't have to replace the whole thing. SUCCESS!